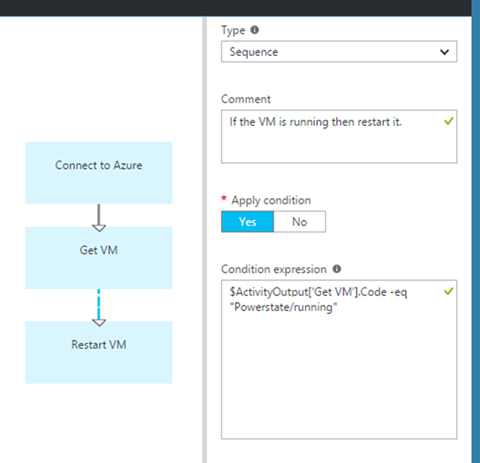 In Azure Automation in the new Azure portal you can author runbooks using a graphical tool and a graphical programming model, with little or no code required. 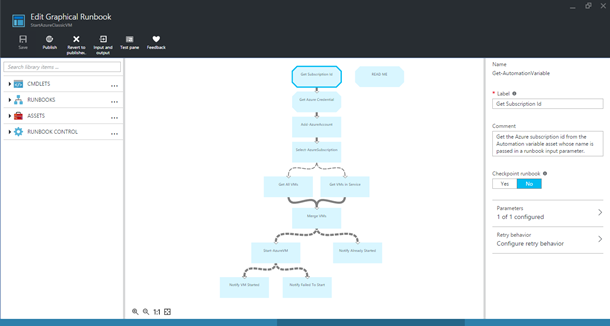 Simply insert activities from the library to the canvas, link them together into a workflow, and configure the properties in order to create useful runbooks that automate your IT processes. Users of System Center Orchestrator will be familiar with this intuitive method of creating visual runbooks. In addition, for those who author native PowerShell or PowerShell Workflow scripts the textual authoring workspace has a large editing pane plus library and testing experiences shared with graphical authoring. The graphical and textual authoring tools are complementary, and you can use either tool or both depending on your requirements. 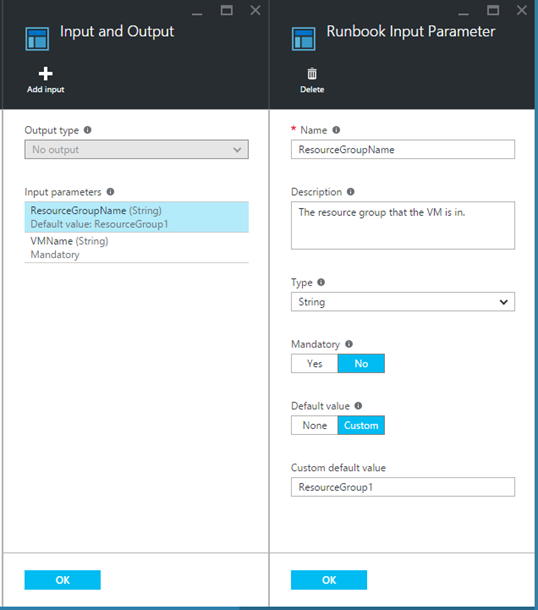 In this post, I will walk you through the features that highlight the graphical and textual authoring experiences in the Azure portal. 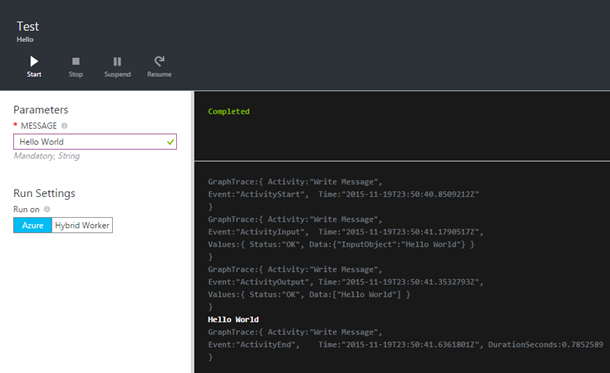 For those of you who like to author runbooks with System Center Orchestrator or who prefer an editor where you can build visual workflows intuitively, the Automation team has released its first cloud-based, graphical runbook editor and graphical programming model for Azure Automation. The library, located on the left side of the authoring workspace, contains the activities that you use to build your runbooks. In the library you have access to all of the cmdlets, runbooks, and global assets in your Automation account. In addition, the library provides you with a couple of key runbook control activities to help complete the graphical authoring toolkit. You can browse through the library to find the activity you need, or if you know the name or part of the name of the activity you can search and quickly find it. Simply click on an activity to chose to add it to the canvas. You can import PowerShell modules to the library to extend the number of systems you can integrate with. These are where you have encapsulated your custom tasks in a reusable, modular manner that you can use to create higher-level runbooks. 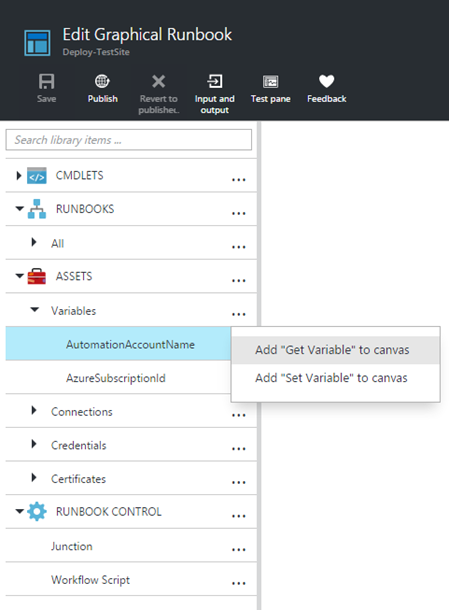 These are the Automation assets where you store the variables, credentials, connections, and certificates that you use in your runbooks. Organized by asset type, then asset name. One of the key features in graphical authoring is the authoring canvas, located in the center of the graphical authoring workspace (see the first screenshot above). The canvas is where you assemble the pieces of your runbook. The configuration pane, located on the right side of the graphical authoring workspace, is where you configure each activity and link in your runbook. This is where you will spend a lot of your time when you author a graphical runbook, so we are making it as simple and intuitive as possible. The basic activity configurations include the label, which will display custom text on the activity in the canvas and which is the unique identifier for the activity in the runbook, and a comment, which you can use to document how this activity is being used. It is easy to configure the input parameter values for an activity. 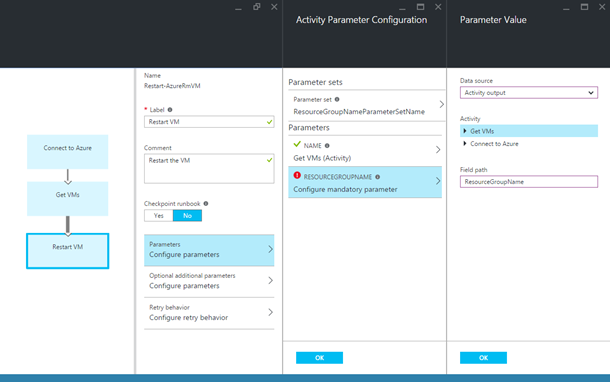 If an activity has parameter sets, first you select the parameter set you want to work with. Then you configure the parameters that make sense for your use. In the UX you can see the type of each parameter, whether it is mandatory or optional, and if it has a default value. Constant value: Set a custom value to be used. Runbook input: Chose a parameter value that was input to the runbook. Activity output: Select to use the output of a previous activity in the runbook. Asset: Use the value of an Automation variable, credential, connection, or certificate asset. 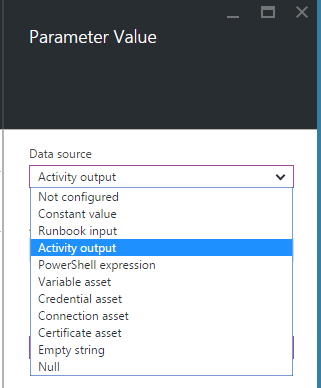 PowerShell expression: This is a flexible option that allows you to use the output from any PowerShell script as the input for the parameter. Empty string or Null: You can even set these as parameter values if you want. For each link that connects activities in your runbook there are key configurations you can make. You can decide if a link will be a Pipeline or Sequence type and also whether you need to define conditions for data flow across the link. In addition, you can leave a comment for later reference. The type of link you choose is very important, because the link type affects how activity output data is made available and also how output from the previous activity will affect the actions of the next activity. Another useful configuration you can set on a link is the Condition. 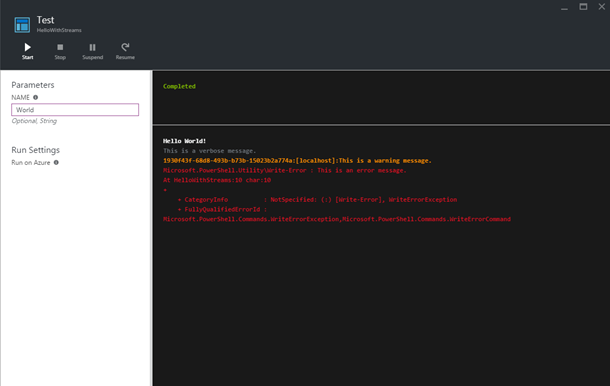 Within the Condition expression you write a PowerShell script statement that returns true or false. By default, if you do not set any link condition, the link will act the same as if it has a condition that evaluates to true. When you are ready to define the input parameters for a runbook, you can click Input and output in the top command bar. For each input parameter you can define the name and type (string, int32, int64, decimal, Boolean, datetime, or object) for each one. In addition, you can define if a parameter is mandatory or optional, and set a default value. To help with documentation you can provide a description for each parameter. 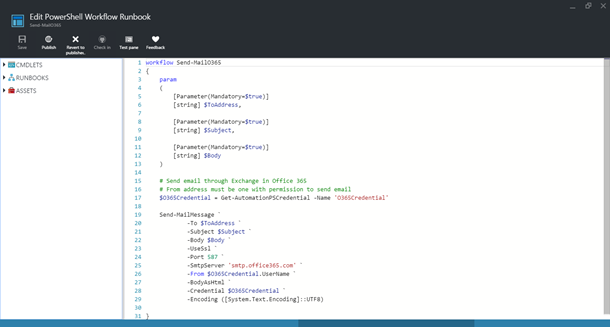 For those of you who like to author runbooks using PowerShell or PowerShell Workflow script, Azure Automation has a textual authoring workspace that helps you with your online authoring work. Included are a large editing pane, an integrated library of cmdlets, runbooks and assets in addition to an integrated test experience. The editing pane gives you line numbering, context highlighting, some intellisense, and search in a large editing window which allows you to see more of your script without scrolling. Parameter value input pane that persists values between test runs, when you keep the test window open, so you don’t have to re-input parameter values with each test. Tests continue even if the test blade is closed; and the output state is maintained with you re-open the blade. Graphical authoring also gives you the option of enabling activity-level tracing (set in the runbook configuration) to display the start time, end time, input data, and output data for each activity to help you troubleshoot runbook issues. The graphical and textual authoring models are different, each with important characteristics that I list below. Some of you will prefer one over the other, and some will take advantage of both depending on the scenario. In general, Graphical Runbooks are ideal for high-level processes where you want to tie together several specific activities and be able to visualize the workflow. Textual runbooks (PowerShell Runbooks and PowerShell Workflow Runbooks) are useful for working with details of the PowerShell language. Below are some useful tips and known issues. We are continually releasing updates to Automation, so you will see the issues disappear over time. In graphical authoring it is important to understand the difference between Pipeline and Sequence link types. Jobs for PowerShell-Workflow-based runbooks that contain child runbooks, can take minutes to get to running state. This is an issue with how PowerShell Workflow compiles runbooks before execution. For textual runbooks you can avoid this by creating native PowerShell runbooks; for graphical runbooks we are working on a fix. None of the job start-up time is included in your Automation usage and bill, only the time that the job is actually in running state. By design in graphical runbooks the Junction activity can have multiple incoming Sequence links but at most only one incoming Pipeline link. However, in the canvas currently you are able to hook multiple Pipeline links to a Junction without getting a warning at design time. We are working on giving you the warning at design time. You cannot run child runbooks in parallel branches. For any PowerShell-Workflow-based runbook, we discovered unpredictable output behavior if a child runbook is run in parallel with another child runbook, cmdlet, or activity. This is an issue with PowerShell Workflow, not Automation. Thus, for now, to help you with authoring we added a check in graphical runbooks that will fail the runbook at startup, with useful error message, if this case is present. During authoring, when you modify runbook input parameter definitions and then want to test the change, you need to save the draft and close and re-open the test pane to assure that the modified parameters appear in the test pane. 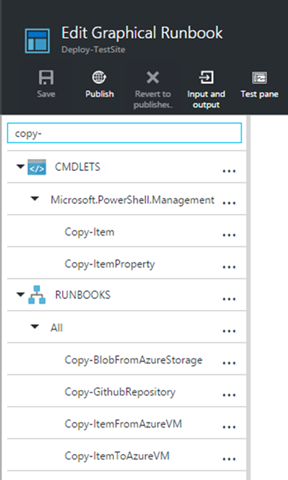 This has been a quick overview of the graphical and textual runbook authoring experiences in Azure Automation in the new Azure portal. These tools enable you to efficiently author runbooks that you use to automate processes. The Automation team is continuing to improve the authoring experiences with new features that increase the value and ease of use. Remember, Azure Automation is a single automation portal for all of your cloud (Azure, AWS, and other) and on-premises IT management.